“Big Cheese in the White House: Admirers of the President Andrew Jackson presented him with a 1,400-pound wheel of cheese shortly before he left the White House in 1837. Jackson invited members of the public to eat the cheese; it was disposed of within two hours.” The Oxford Encyclopedia of Food and Drink in America, Andrew F. Smith (Editor). Bazmaawurd ready to be rolled. Yesterday, I had a few friends over, and we tried some of these 1,000 year old dishes. To begin, I presented Bazmaawurd: chicken, walnuts, fresh herbs and lemon (it was supposed to be citron, but I couldn’t find one fresh) rolled up in a Lavash. I think this was everyone’s favorite. The flavors were so fresh, light and zesty. I found it to be a little dry–but it went nicely with some labneh. Next I dished up a seasoned lamb dish called Mulahwajah, of which I neglected to take any photos (tipsy). I stewed lamb meat with leeks, onions, a cup of water, and a fascinating spice blend: coriander, cinnamon, caraway, pepper, and galangal. The latter is a spice with a light, flowery, almost citrus taste. And this recipe calls for a lot of spice: 5 1/2 teaspoons for a 1/4 pound of meat. It covered the meat completely, but lamb has such a pungent flavor it stands up well to heavy spicing. The result was a dish that blurred the boundary between sweet and savory with flavor unfamiliar to western tongues. Lastly, I made Juudhaab: “The supreme roast meat dish was juudhaab (or juudhaabah), where the meat was served on a sweet pudding which had been baked at the bottom of the tannur to catch its dripping juices.” This dish is vaguely similar to Yorkshire Pudding, in that a soft bread is cooked using fat from the meat it is served with. But the resemblance is remote; in fact, I have never heard of a food prepared quite this way before. Translated by Linda Dalai Sawaya for Cooking with the Caliphs. 1. Preheat oven to 500 degrees. Place apricots in small saucepan, add water to cover apricots by ½ inch. Bring to a boil and stew until apricots are soft and the water has reduced to a thin syrup, about 15-20 minutes. 2. In a baking pan or bottom of a broiling pan, place one lavash. Strew with apricots in syrup, sugar and 1/4 cup rosewater in which pinch of saffron has been dissolved, then cover with remaining lavash. Cover with a wire rack or top of the broiling pan. 3. Wash chicken and pat dry. Mix 2 tablespoons rosewater with pinch of saffron and rub on chicken, inside and out. Place on rack or on broiling pan. 4. Bake at 500 degrees for 20 minutes, then turn heat down to 325. Roast until a thermometer inserted into the thickest part of the thigh reads 160-165. 5. Carve chicken and serve in slices over the lavash and apricot pudding. The result was interesting: I wasn’t thrilled with the slightly greasy taste and texture of the sweet pudding. 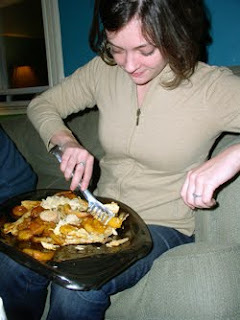 But my guests tore into it with grunts and “mmm”s. The lone vegetarian was mortified. But we still love her. Check out all of these recipes and more in the original article here. Head’s up! The Brooklyn Beefsteak is back February 20th. Stay tuned into their blog for updates here, and read my write up of their fall event here. Historic Faux Foods: “Sandy Levins researches the foodways of bygone eras to create historically-accurate individual faux foods as well as entire period table and room settings. ” Rendered in astounding accuracy–check out her website. It was my birthday last weekend, January 15th to be exact, which also happens to be the day before prohibition went into effect in 1920. So I decided to throw a “Drink Like Prohibition Starts Tomorrow” party. 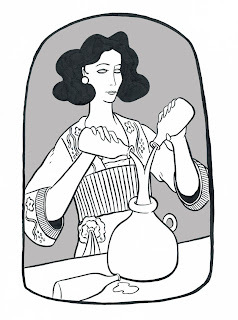 I selected pre-prohibition cocktail recipes for gin, rum, whiskey, applejack, absinthe, champagne and beer. I provided a table full of mixers, tools, garnishes–everything my guests would need to shake up their own classic cocktails. Most of the recipes I selected came from Tom Bolluck’s 1917 book The Ideal Bartender. But two of the more interesting recipes I pulled from Sloppy Joe’s Bar Guide. Published in 1932 (originally 1931), the book features recipes from Sloppy Joe’s, a bar located in Havana, Cuba that was freqeunted by the likes of Clark Gable and Ernest Hemmingway. I first learned about this book while researching the origins of the Mojito; the first printed recipe for a Mojito appears in this book. An interesting note, this drink appears in the section labeled “Bacardi Drinks.” Barcardi was preferred for this drink because it was a filtered rum: it had a light flavor and was clear. I served this drink in a rocks glass; should you want to make a full 8 oz. drink, I recommend doubling these proportions. Fill a glass with ice. Add sugar, and lemon juice. Add rum, and fill glass with seltzer water. Add 4-6 leaves of fresh mint. Stir cocktail until condenesation appears on the outside of the glass. Add the lemon shell and serve. This drink was a real standout for me over the evening: I felt like it was a revelation in drinking and a vast improvement over contemporary Mojitos. The flavor is light, refreshing, and just the right amount of sweet. It reminded me of the fresh squeezed lemonade I used to get at the county fair–but boozier. So in retrospect the drink probably should have been made with lime–but the lemon juice was delicious. 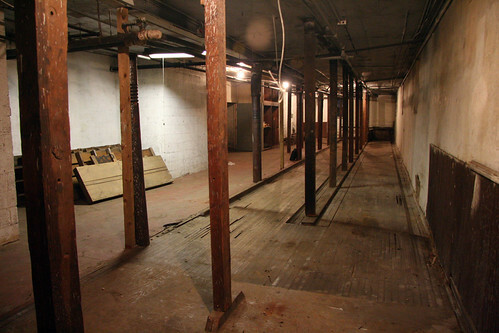 I work part time as an educator at the Lower East Side Tenement Museum(Wednesday and Saturday if you ever want to stop by and see a tour). While studying information for a new tour, I came across a mention of “Charlotte Russe.” Charlotte Russe, it said, was sold from pushcarts on the streets of the Lower East Side in the 1920s. “What the hell’s Charlotte Russe?” I wondered. Charlotte Russe, in it’s simplest form, is whipped cream adorned with lady fingers. The fanciest version I’ve seen involves mace-flavored whipped cream, mixed with isinglass, and pressed into a mold lined with almond sponge cake. Sounds pretty good, right? 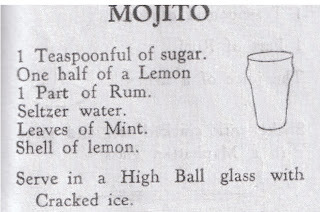 I plan to give this latter recipe a whirl in the near future. Left: Image from Miss Corson’s Practical American Cookery and Household Management. by Juliet Corson, 1886. For this experiment, I selected a recipe of middling complexity that was close to the time period I was learning about. It comes from Fannie Farmer’s infamous Boston Cooking School Cookbook, one of the most popular cookbooks of its time because it was the first to offer standardized measurements. 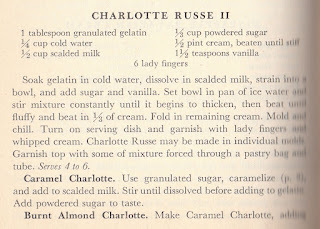 From The Boston Cooking School Cookbook (Seventh Edition) by Fannie Merritt Farmer, 1941. 1. 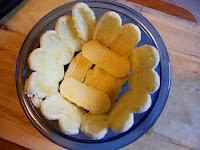 Line a mold with the ladyfinger cookies. A medium-sized bowl works just fine. 2. Beat cream with an electric mixer until it forms stiff peaks. Set aside. 3. Dissolve gelatin in cold water. Heat milk in a microwave for two minutes on high, then add to gelatin. Add sugar and vanilla, whisk until sugar is dissolved. 4. Set in a pan of ice water, stirring constantly until the mixture just begins to thicken. Or, you can place the mixture in the freezer, stirring every minute. But be careful! If the mixture gels too long, you’ll end of with tapioca-like lumps in the final product. 5. Beat with an electric mixer on high for five minutes; then add in 1/3 of the whip cream and mix until thoroughly combined. Gently fold in the remaining whip cream with a spatula until just combined. 6. Pour into the ladyfinger mold, using a spatula to smooth out the top. Refrigerate for at least two hours, or until set. Turn out onto a plate and serve. I served this at a dinner party and we all agreed it was tasty, but a little plain. It was like inside-out angel food cake. I think although it was a little boring for our modern day pallets, it probably would have tasted like heaven to a kid on the streets in the 1920s. So you pushed the whole thing up like a cake and cream push pop. Ok, yes. I should be posting more often. I know. But please don’t think I’ve abandoned this blog; in fact, my silence has come for all the right reasons. I’ve got some great projects in the works. I’m putting together some exciting events for the spring, including another New York 19th Century Pub Crawl in May, AND I’ll be taking the Pub Crawl on the road to Boston this April. I’m also continuing my relationship with the Old Stone House in Brooklyn; we’ll be presenting some fun, free events in the near future. I’m working on an article for the summer issue of Edible Queens Magazine, featuring an historic menu you can make yourself and dazzle your friends. I’m also shooting a short documentary with PBS Japan–so if you have Japanese cable, or if you are in Japan, you can see me there. I’m also working with two talented friends, Ben Kinsley and Peter van Hyning, to redesign this blog. We’ll be launching a whole new look in the coming months. So stick with me. We’ll have some fun. Although I am history enthusiast, I have never once longed to live in a time other than my own. In fact, I’ve never quite understood those who want to go back to the “simpler time” of the Victorian era. Before germ theory?? Before Antibiotics?? I don’t quite get it. Luckily, The Daily Show agrees with me, and produced this hysterical segment which beautifully illustrates my point. It features Great Depression Cooking star Clara Cannucciari recounting her tough times in the 1930s (try the Poor Man’s Meal! It’s delicious!). I think we need to appreciate the time that we live in, while keeping the past in our hearts and minds. Macaroni and Cheese is largely thought of as a modern dish, thanks to the “Kraft Dinner,” introduced in 1937 and used as rations during WWII. But good ‘ol Mac n’ Cheese has a much longer history. In fact, I’ve already cooked up two different versions of this classic dish on this blog: a simple, 19th century version I ate during the Tenement Diet, and a more decadent recipe using neufchatel cheese during the Kellogg Diet. The earliest known American recipe for macaroni and cheese appears in The Virginia Housewife, first published in 1824. This is the recipe that we shall attempt today. It seemed decadent to boil the macaroni in milk, but I gave it a whirl to stay true to the recipe. While the pasta was cooking, it smelled sweet like a rice pudding; however, upon tasting it, I could discern no noticeable difference. I think that this step could be left out, if you desire. I used a Queso Blanco, an un-anged, simply made Mexican cheese. I choose it for it’s similarity to farmer’s cheese, and other fresh cheeses used in the 19th c.
from The Virginia Housewife: or, Methodical Cook By Mary Randolph, 1838 ed. 1. Preheat oven to 350 degrees. Bring one quart milk and an equal amount of water to a rolling boil. Add macaroni and cook, uncovered, until al dente, about 6 1/2 minutes. 2. Drain in a colander. While still in the colander, sprinkle pasta with about a 1/2 tsp salt, shake to combine, then sprinkle with about 1/2 tsp more (or to taste). 3. Our about 1/3 of the pasta into a casserole or baking dish. Cover with 1/3 of the cheese and butter. Repeat, ending with a layer of cheese and butter on top. 4. Bake uncovered for 25-30 minutes, or until cheese is melted and bubbly. My roommate and I took two bites and then made frowny faces at each other. I don’t think this is the best incarnation of Mac and Cheese. It tasted like buttery noodles. And then…something was OFF with the cheese I bought. It had an odd bitter/fishy taste. I don’t know if was the brand of cheese, or if the cheese was bad. But I would take Kraft over this any day. Do you think I can survive for one week on only foods that I hunt, forage or find? Let me remind you that I happen to live on a fourth floor walk up in Queens. Let’s find out together: I’ve volunteered to become part of a project called Starting from Scratch. Along with four other family groups, I’m going to attempt to be entirely self-sufficient for one solid week in July. Read through my game plan (and give me some feedback) here.